Sat with a brew and a slice of lemon cake in his Forest Schools uniform, Sherif, from Walmley, looks settled and confident. He started volunteering for the Kingstanding Food Community in December and hasn’t looked back since. 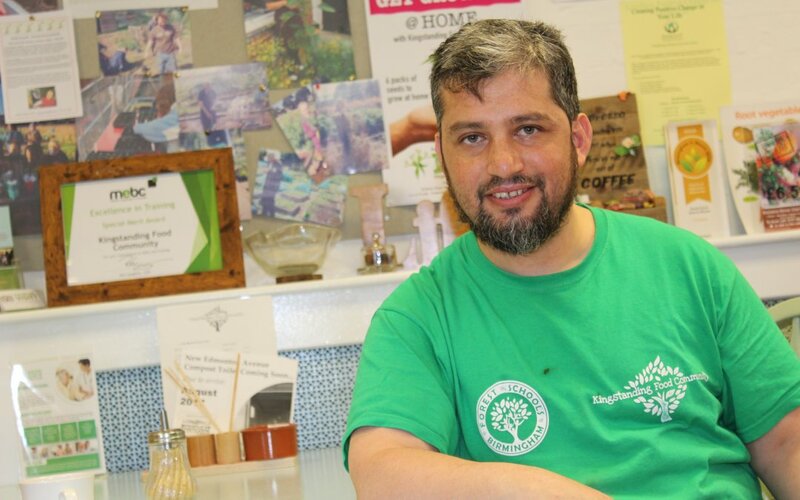 As an epileptic with learning difficulties he’s found it difficult to stay in long term work, voluntary or paid, but after being referred by his psychologist he’s been able to flourish. “I’ve made new friends since I started here and people have been really supportive. Every day I come here it’s something different. I’m involved in the cleaning and the serving. I’m not involved in the cooking yet, but I’d like to do that in the future. “I’ve had situations in the past, I was mugged on the bus, it happens to some people and it was a long time ago, but it made me lose my confidence. “I was very pleased and proud when he was given this opportunity. I can see how this move is changing him, his personality is coming through and his confidence is improving. Forest Schools deliver outdoor learning programs and community engagement projects throughout Birmingham and the West Midlands and they have extensive experience in the special needs sector. The Heart of England Community Foundation has supported Forest Schools Birmingham with almost £20,000 since 2016. The Kingstanding Food Community is one of their flagship projects and has been supported by the Fourteen – Sprit of 2012 fund.